‘ALEXA, SNOOP ON MY WESTERN BUDDIES’ is potentially a command Chinese hackers barked at an Amazon Echo after they managed to turn it into a snooping device. Cybersecurity boffins from Chinese firm Tencent’s Blade security research team exploited various vulnerabilities they found in the Echo smart speaker to eventually coax it into becoming an eavesdropping device. The hackers showed off the snooping speaker at the DefCon security conference, reported Wired, using it as a demonstration for the potential for smart home devices to be used for surveillance. But before you boot your Echo or Google Home out of the nearest window, the hackers noted that getting into the Echo was hardly an easy process, and Amazon now has fixes for the security holes. “After several months of research, we successfully break the Amazon Echo by using multiple vulnerabilities in the Amazon Echo system, and [achieve] remote eavesdropping,” a description of the hackers work, provided to Wired, explained. The hackers first needed to create a spying-capable Echo, which involved a multi-step penetration technique with enough intricacies to get past the device’s built-in security. This included taking apart the Echo, removing its flash chip and writing custom firmware onto it before remounting the chip. Once done, the Echo then had to be connected to the same network as a target device Echo device. 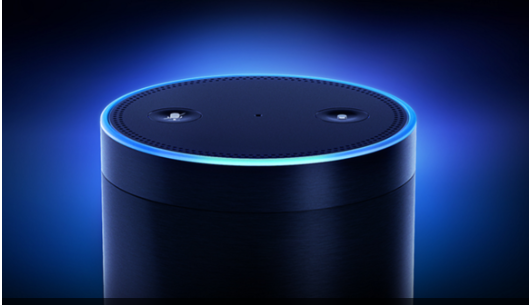 From there, the hackers could exploit a vulnerability in Amazon’s Whole Home Audio Daemon, which can communicate with other Echo devices on the network, and gain control over targeted Echo gadgets. And, from there, they could then snoop on their victims and pass recording back to the malicious Echo or pipe all manner of sound through the hijacked Echo. The technique is hardly an easy or particularly remote way to hack an Echo, but it does conjure up some techniques spies could apply in surveillance operations, providing they have permission to sneak into a person’s house, or they could go rogue like Ethan Hunt does in pretty much every Mission Impossible flick. The whole situation also highlights how security in such devices needs to be given as much attention as other smart features, as there’s already been a swathe of examples where lax security in smart or connected devices has lead to hack attacks. USB charging cable with hidden eavesdropping GSM device (SIM card slot) ©Shapestones. Technology has advanced so quickly that stalkers are now able to carry out digital surveillance on their targets – bugging their phones and accessing their locations with ease, victims’ groups warn. 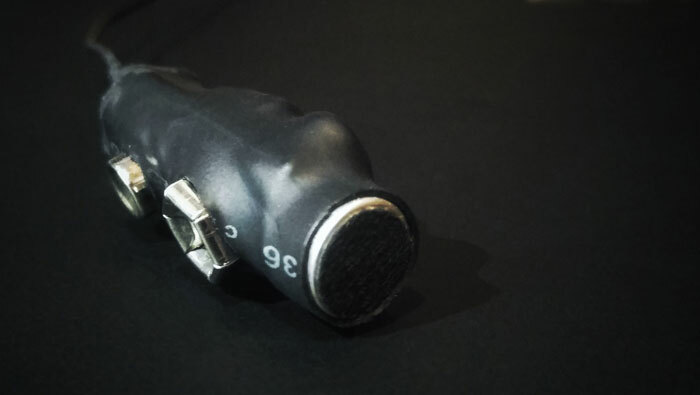 Everyday more and more people are engaging in stalking, using listening devices that cost as little as £20 ($28) some of which can easily be hidden inside plug adaptors. Companies like Amazon and eBay are selling spy tools over the internet, with victims’ helplines announcing an increasing number of complaints as a result. 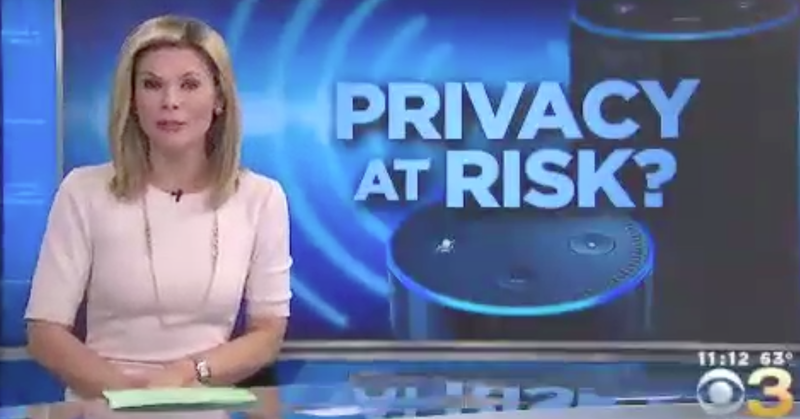 “We see this regularly… they put in listening devices or video devices in the house or tracking devices on the car and you can buy all of that on Amazon,” Chief Executive of Digital-Trust Jennifer Perry told the Guardian. Another woman’s ex used a bug inside an extension lead. The former partner was then texting her details of the bedtime stories that she told her children. Spyware and spying apps were also used in roughly 130 cases dealt with by the national helpline. Shockingly, the camera of a laptop can be turned on by someone remotely using the software, while keystrokes can be traced to read conversations from the device. The purchase and installation of such devices is now illegal under the Computer Act of 1990. In the 11 months to November 2017, the National Stalking Helpline received 4,337 calls or emails. More than half of cases were involving an ex-partner and 77 percent of the victims were female. After the Guardian alerted eBay to the existence of the USB and plug listening devices, the items were removed from the site. Donal MacIntyre’s estranged wife has been arrested after he allegedly found a spy camera disguised as a coat hanger in his home. Ameera MacIntyre, 43, is accused of using his credit card to buy it on Amazon and getting a third party to plant the device. The hook has a tiny lens concealed at the top and a microchip to record sound. 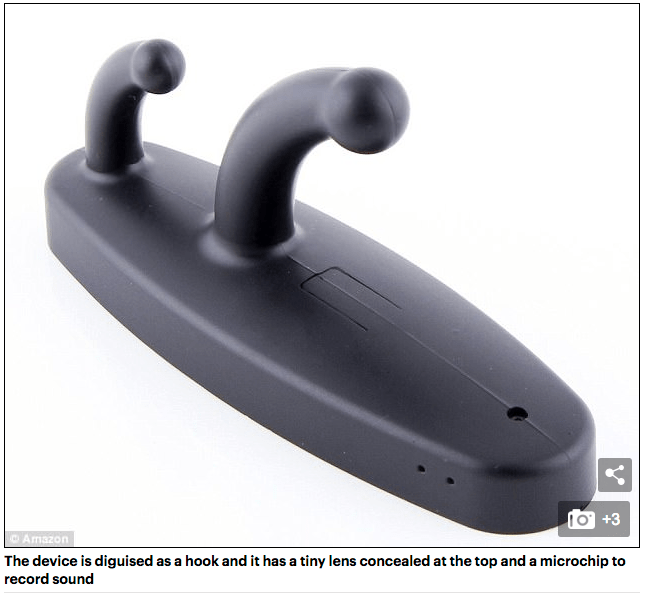 Detectives are investigating how the device, which cost as little as £10, was planted in Mr MacIntyre’s Surrey home. 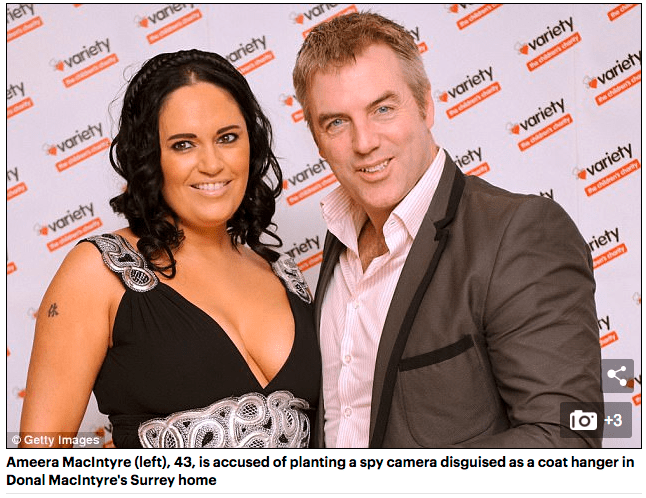 The mother-of-four Ameera was arrested at her home on suspicion of theft and is alleged to have bought two other items using Mr MacIntyre’s credit card without his permission. Computers were seized and Ameera was also held on suspicion of possessing cocaine. Donal and Ameera broke up bitterly in 2015 and she publicly accused him of being a ‘cheating scumbag’. They were married for nine years and have three kids.